Forty-nine exhilarating paintings created by seven vibrant persons living with dementia— each sharing a unique view of the world. Delightful and surprising, the artwork effortlessly connects us—a vivid illustration that persons living with memory loss and dementia are Still Here—living with dignity, purpose and joy. Meet these valuable community artists and their families, along with care providers at the Opening Reception. Enjoy light hors d’oeuvres and an exhibition tour. Presented by The Art of Alzheimer’s. Art created at Elderwise. Reception on Thursday, May 4, 4-6 p.m.
An exhibition celebrating the 30th anniversary of the Contemporary QuiltArt Association, Coming of Age II, is coming to Seattle’s City Hall on May 4. The exhibition is a celebration of the many ways that fiber can be used in today’s art quilts. The artworks demonstrate the growth members have made over the last three decades. The exhibit features 38 pieces of fiber art from 25 different artists that live in Washington State. The Contemporary Quilt Art Association, a non-profit arts organization run entirely by volunteers, is a Washington state group formed in the fall of 1986. This diverse group of artists, teachers, writers, and collectors lives throughout Washington, and view quilts as an exciting medium of expression and a viable contemporary art form. They are proud of the years of CQA exhibitions around the state, the nation, and the hemisphere. CQA includes national and internationally celebrated quilt artists among its members and are equally proud of aspiring and emerging quilt artists, and those who have worked only in traditional quilt-making and are now curious to explore other possibilities. Super Cooper 10 will feature the work of more than 20 artists past and current tenants of Cooper Artist Housing and the Youngstown Cultural Arts Center since its inception in 2006. The exhibition includes more than 40 artworks including paintings, sketches, sculpture, photographs and even a kayak. A decade ago, three floors of the old Frank B. Cooper School on Delridge Way SW became one of only four affordable housing programs in Seattle dedicated to low income creative people. Since then, the converted-classroom live/work studios, numbered lockers, and wide shiny hallways have incubated the generative works of over 100 individuals: poets, aesthetes, designers, painters, writers, dancers, sculptors, musicians, performers, photographers, film makers, multimedia artists and builders, to name just a few. Cooper Artist Housing has also forged a strong community, in which children have been born, friendships have been made, collaborations have launched, and creative careers have taken flight. The Youngstown Cultural Arts Center, housed on the first floor of the Cooper School, also celebrates 10 years this year. Youngstown is a jewel of the diverse Delridge neighborhood and a national model for engaged community collaboration, hosting and producing youth programming, performance arts and a multitude of other activities. Youngstown houses eight nonprofit organizations and a branch of Interagency, an alternative public high school, and rents space to community groups for a variety of uses. Upwards of 30,000 people visit Youngstown each year for work, school, workshops, classes and programs. Artists featured in Super Cooper 10 include Iole Alessandrini, Flynn Bickley, Susanna Bluhm, Smitty Buckler, Gina Coffman, Reneé DeMartin, Yvette Diltz, Gretchen Van Dyke, Crystal Fosnaugh, Barbara Fugate, Sean Gallagher, Maureen Brogan Glidden, Paul Goldstein, Nate Herth, Richard Kent, Koji Kubota, Joey McChan, Erin Miller, Androu Morgan, Mike Mullins, Tenaya Sims, Sharon Swanson, BK Tran, Teresa White, and Benjamin Yarges. Artist Reception on Thursday, October 20, 4-6 p.m.
SEATTLE, (Sept. 27, 2016) —The Seattle Office of Arts & Culture presents The Eclectic Collection: Artworks by former Artists-in-Residence at the James and Janie Washington Foundation, an exhibition featuring 51 works celebrating the artists whose work has been inspired by sculptor James Washington Jr. The exhibition will be on view in the Seattle City Hall Gallery, September 9 through October 28, 2016, with an artist reception on Thursday, October 20th from 4 – 6 p.m. in the gallery. The exhibition features artists who served as artists-in-residence at the James and Janie Washington Foundation from 2009 to 2015. The artworks represent a range of mediums including metal, mixed media, found materials, ceramics, wood, photography, printmaking, paper and paint. Artist included in the exhibition work with a variety of different media and come from different backgrounds, but they all exemplify commitment to prolonged acts of creation, as did Washington. The James and Janie Washington Foundation was established in 1997 as a nonprofit organization to preserve the art, writing, and lifetime works of Dr. James W. Washington Jr. The Foundation’s artist-in-residence program offers artists the freedom, space and time to explore their creative process in new ways. Washington (1909-2000) was an eminent African American sculptor and painter and was a leading member of the Northwest School. He was born and grew up in rural Mississippi in the segregated South and spent the majority of his career working from his Seattle studio. His work is represented in more than 600 private and public collections, including The Smithsonian, the Whitney, SFMOMA and the Seattle Art Museum. The Seattle Police Department (SPD) will present an exhibition of two different employee development projects sponsored by the Seattle Police Foundation, on view at City Hall May 2 through June 28. An opening reception for the exhibition will be held 4 to 6 p.m., Thursday, May 16, at City Hall. Technological Transitions: Historical Artifacts from the Seattle Metropolitan Police Museum is an historical look at policing technology and equipment used by SPD throughout the history of the city of Seattle. Eighteen images include historical badges, weapons, and montages of past and present equipment. Images are set on a solid black background and include a description of the item and why it was used at the time. All of the actual historical items and their history were supplied by the Seattle Metropolitan Police Museum, a non-profit organization in downtown Seattle. The second project, Contemporary Portraits of the Men and Women of the Seattle Police Department, consists of 26 black-and-white portraits of police department employees with more than 35 years of service, as well as recent award recipients. The awardees included in this exhibition are some of the many employees recognized for their hard work, bravery and dedication to the citizens of Seattle. The SPD photography unit photographed all images in this collection. IMAGE: Portrait of­­­­­­­­­­­­­­­­ SPD Pipe & Drum Members, 2012, black and white photograph, 26″ X 36″. Photo courtesy of the Seattle Police Department. 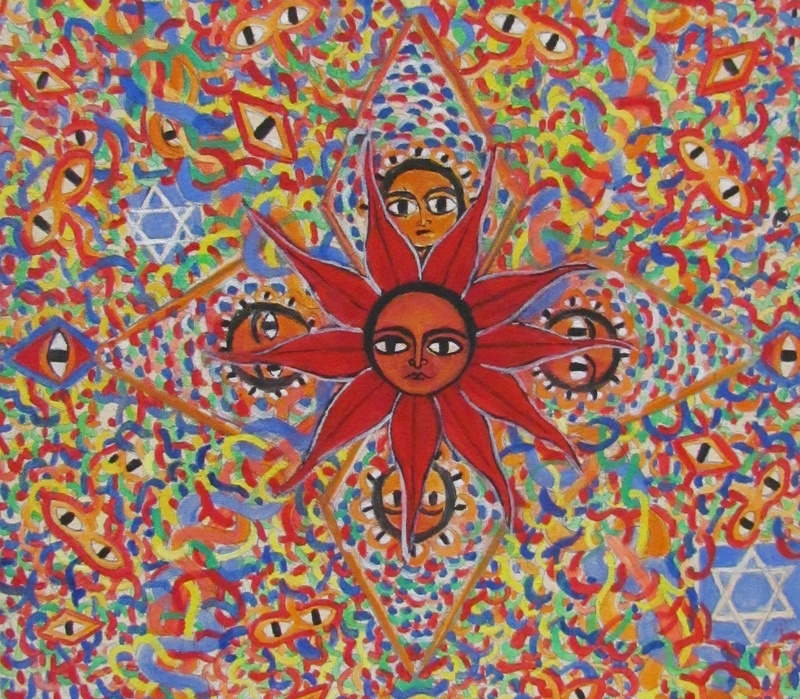 Head over to City Hall and see 45 paintings by 10 Ethiopian artists through March 4. The artists, some professionally trained and some self-taught, hail from Seattle; Washington, D.C.; and Addis Ababa, Ethiopia. In Ethiopian Art: Tradition, Assimilation and Change, a wide range of painting styles, both traditional and contemporary, highlight Ethiopian art, artists and its visual culture. An artist reception will be 4 to 6 p.m., Thursday, Feb. 7 at City Hall. The exhibition reflects the dynamics of current Ethiopian artistic movements both in the country and among the diaspora. The show also also presents current artistic philosophies among individual artists and groups. Unlike the traditionally known and religiously themed Ethiopian style, this body of work deals with personal, social, historical and psychological subject matters. Artists included in the exhibition are: Admassu Addisu, Kerima Ahmed, Atakilt Assefa, Nebeyou Assefa, Seyoum Ayalew, Getachew Brihanu, Meseret Desta, Mekibib Gebretasadik, Fasika Moges, and Melaku Tesfaye. Images: Untitled (Detail), Melaku Tesfaye, acrylic on canvas; Untitled, Seyoum Ayalew, acrylic on canvas. Haiti’s January 2010 7.0 earthquake left more than one million people homeless, 220,000 killed and 300,000 injured. The country, people, culture and struggle are captured through the work of three Pacific Northwest artists in the exhibition Remember Haiti. The show opens at a reception, 4 to 6 p.m., Thursday, Sept. 6 and is on view through Nov. 2 at City Hall. Remember Haiti offers a vision of Haiti through the eyes of artists Olivia Pendergast, Robert Horton and Eric D. Salisbury. Pendergrast spent months in Haiti before the earthquake to capture the spirit and culture of the people. Horton and Salisbury went to Haiti one year after the earthquake as part of a mission trip organized by Of One Body, a Seattle nonprofit organization. Horton and Salisbury’s art shares the strife, chaos and sadness of lives changed and lives lost. Remember Haiti will consist of approximately 36 works in watercolor, acrylics and sumi ink drawings. Information will be available on how to make a difference in the lives of those affected by the earthquake. Image: Olivia Pendergast, Red Jumper Orphanage 1, 2011, oil, 36” x 36”. Photo courtesy of the artist.